Rahul Bheke couldn't hide his happiness and he didn't have to. "Apna Time Aayega," Harmanjot Khabra teased Bheke as he walked past him in the mixed zone at the Mumbai Football Arena. 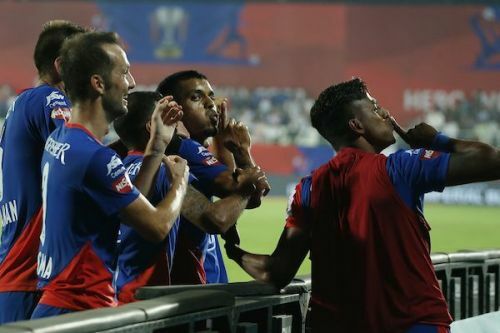 It was a little after Bheke scored a sensational header for Bengaluru FC in extra time against FC Goa for the Indian Super League (ISL) title on Sunday, March 17. After the disappointment in last year's ISL final against Chennaiyin FC, it was only fitting that Bengaluru found the winner against Goa from Bheke of Aamchi Mumbai. Apna Time Aa Gaya? Bheke smiled. No, Bheke isn't quite done yet. "Asia is next level for us," Bheke told Sportskeeda, referring to the AFC Cup that BFC will be a part of next season. "We have to keep working on it. Most important part of BFC is that we keep working and keep working on it." Don't reduce Bheke to a mere ISL trophy with Bengaluru FC this season. He's a warrior who fights to claim what is rightfully his, even if they don't hand him. Just in December last year, Bheke was ignored from the Indian national football team squad by then coach Stephen Constantine for the Asian Cup in January despite one and a half season of consistent top display for Bengaluru FC. Going by the general perception on the player, winning the Fan's Player of the Month in November wasn't enough for Bheke to get in. Even if you had gone by form, two goals and one assist from a defender who had 990 minutes for a club weren't enough for Constantine to consider him for the 34-man probables list. Did it hurt him? Yes. That probably was one of the lowest points in Bheke's career but he will never tell you about that. There's no limit to the demons that Bheke has had to overcome. Bheke doesn't rant or show his emotions about those. He expresses it on the pitch. And through January and February, Bheke showed what India did not have at the Asian Cup in UAE - a hard-working player who can fit into any of the positions in the defence. Just in the last few matches for Bengaluru alone, Bheke played as a left-back, right-back, wing-back and even a central defender. Sometimes, he switched into different positions within the game and it's a loss really for India to snub a player like Bheke for an important tournament. Adversity is, after all, nothing new for Bheke. Soon after the national team snub, which in itself was a blow for Bheke's mindset, the 28-year-old landed in Mumbai only to learn of his father's death. Just imagine. You come to Mumbai to play an ISL match and have to surpress your emotions until the game is done for your team. We're all weak but this Bheke we're talking about. Bheke finished the game, went home to complete the rituals, asked coach Carles Cuadrat for an extra day to be with his family and turned up in Bengaluru a day later for a game against NorthEast United. And he played the full 90 minutes in both these games. And now, let's talk about March 17. Bengaluru had a few chances but FC Goa's Mourtada Fall kept them from scoring. The game went into extra time and almost seemed like it was going into penalties. Then, Rahul Bheke takes over. It was clear that Bengaluru had to distract Fall if they wanted to score before penalties. Dimas Delgado signalled the corner-kick routine that he would play. Bheke broke away from his marker, took Goa by surprise and from 16 yards out, leaped for a glancing header that looped over Goa's Naveen Kumar. Bengaluru, Bheke's adopted home, erupted in joy. Mumbai, Bheke's home, loved it. A father too. And do you know what's the best part about Bheke? Even in victory, he stays grounded and humble. "I think it's a great feeling. Each and every player loves this feeling (of scoring a goal). I am lucky I scored in the final minute and in the final game. "Last year, I didn't score any goal but this year, I scored three goals and two against Goa," Bheke said. Apna Time Aa Gaya? Na. Apna Time Phir Se Aayega. There's more where that came from. "Every single year we have won a title and I am really happy I am with this club," Bheke added. "We've been winning one Cup a season. This year, the target is to win 2 trophies and then take on Asia."